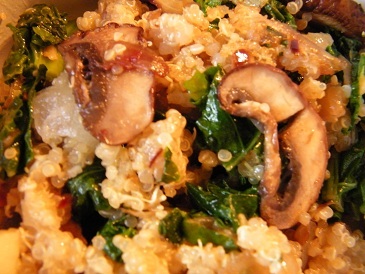 To feed my growing quinoa addiction, I made quinoa with kale and baby bella mushrooms. At first bite, I felt the texture of the slightly still crisp curly kale, the softness of the mushrooms, and the roundness of the cooked quinoa seeds. The flavors of garlic and the hearty baby bella mushrooms mingled on my tongue, but I couldn’t help but feel that something was missing flavor-wise. Don’t get me wrong, this vegan dish was good, but it just didn’t have that quality that makes a recipe great. I had a little bit of leftover balsamic vinegar dressing I’d made for that night’s salad, just sitting on the table. On a whim, I drizzled a little bit of dressing over the steaming quinoa and took a bite. There it was, that flavor combination I hungered for. And so, this kale and quinoa salad topped with balsamic vinaigrette was born. Read on for the recipe. Add the quinoa to a sauce pan with two cups of water. Heat over medium-high heat. When it begins to boil, turn down the heat and let it simmer over medium-low until all of the water is absorbed. While the quinoa is cooking, chop all of the vegetables. Heat olive oil in a frying pan. When the pan is hot, add the onion. Let the onion cook for 3-5 minutes, then add the diced garlic. When the garlic begins to brown around the edges, add the portobello mushroom slices and the kale. Stir in the spices at this time also. As the veggies are cooking, make the dressing. Combine all of the ingredients for the dressing except for the olive oil. Whisk the ingredients together, then very SLOWLY add the olive oil as you continue to whisk. When the quinoa is done, add the other half tablespoon of extra virgin olive oil and the vegetables. Mix well. Finish by drizzling the balsamic vinaigrette over the quinoa. What do you like to pair with quinoa? Feel free to post any of your favorite quinoa recipes below! Really? I just recently tried it and now I love it. If you are ever in the states you should try it 🙂 I’m sure you have lots of other delicious foods in Australia that we don’t have. Also all of your wildlife pictures are gorgeous!